The ongoing process of global digitization has incorporated the term Big Data in our day-to-day lives. Whatever activity we do over the internet it either directly or indirectly becomes a source of business information. The over rising global statistics in the usage of data has presented a wonderful opportunity across the IT & corporate based business organizations to mine & explore the insights of the data for the development of their business. Having the presence of some of the most sophisticated tools for data management, Hadoop has emerged as a major outlet for IT & corporate firms to store & retrieve accurate information from a large amount of data. 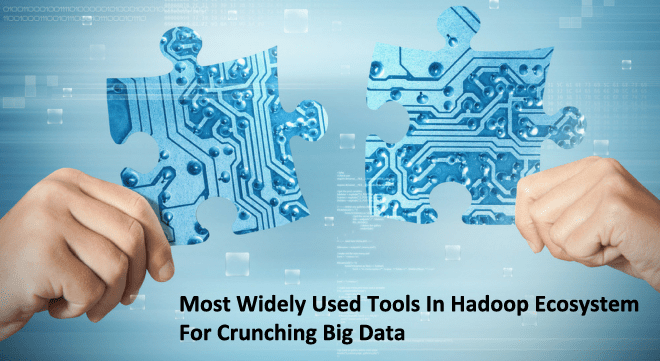 Let us build a broad understanding of the advanced tools that are extensively being used in the Hadoop ecosystem for crunching Big Data. It is a scripting language which makes the data manipulations that are commonly needed for analytics. Hive produces a questioning language which is similar to SQL which can interface with a Hadoop-based Data storage house. Spark implements an interface for programming entire data clusters with fault-tolerance. HBase is also developed as a part of Apache software which runs on the Hadoop Distributed File System (HDFS). It is a server-based effort scheduling system to manage Hadoop jobs. Functions in Oozie are defined as a collection of control flow and it is implemented as a Java web application. It is also known as Command Line Interface and Character User Interface which means the user interacting with a computer program. Sqoop is used for transferring the data between relational databases and Hadoop. It is one of the operating system projects of Apache Software Foundation. ZooKeepers’ Architecture supports high availability through the extravagant services. It is a distributed stream processing which means a computer programming, equivalent to event stream processing which would be designed with the set of technologies, it includes event visualization, databases and much more. It is a reliable and available service for collecting and moving a large amount of data efficiently. It is used for a simple, extensible data model which allows the online analytic application. Where Can You Build Knowledge Of All The Advanced Tools Used In Hadoop Ecosystem? Kelly Technologies delivering the Hadoop Training In Hyderabad is widely suggested by the domain experts in relation to gaining hands-on acquaintance & in-depth knowledge of all the advanced data management application tools used in the Hadoop ecosystem. You can also prefer Hadoop Online Training by Kelly Technologies for the same. It’s high time to make a career move in Hadoop profession.